Last Friday evening, Rev. Chad Brooks, pastor of Foundry United Methodist Church in Sterlington, loaded up the back of his truck with 500 "foam fingers" to distribute during the local high school football game. 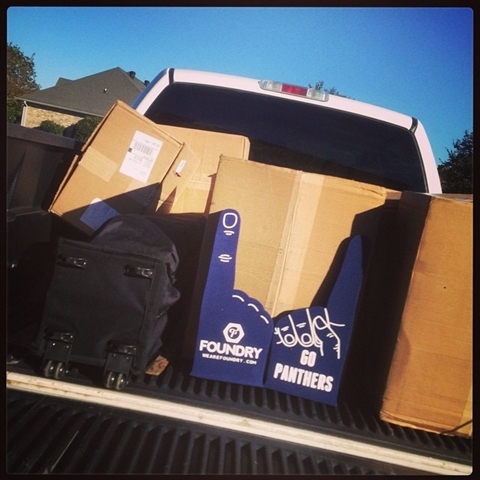 While the Sterlington Panthers "battled" the Winnfield Tigers on their home field, Brooks and other church volunteers handed out the foam fingers, which had been printed with "Go Panthers" on one side, and "Foundry" on the flip side, along with the church's web site address. “We are located in an area that is brand new. Everything revolves around just a few things, and high school football is one of them. At Foundry, we take John 1:14 very seriously. And since Jesus came to the world to be with us on OUR ‘home field,’ I’m thinking He would be cheering for the home team, too!,” said Rev. Brooks. The crowd loved receiving the foam fingers, and “had a hard time believing that it was a gift,” said Brooks, adding that the church noted a “serious bump” in Foundry website traffic after Friday night.